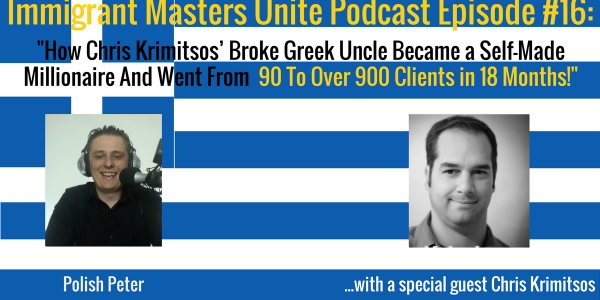 IMU 016: How Chris Krimitsos' Broke Greek Uncle Became a Self-Made Millionaire And Went From 90 To Over 900 Clients in 18 Months! - Part 1 of 2 | Immigrant Masters Unite Podcast: Transform Your Business, Life and The World Around You! Unbelievable story of how uncle Gus came to United States and started his restaurant from being a busboy, walking to his job for 1 hour, almost going out of business and what shifted that business to become a self-made millionaire. What it means and what it takes to become successful from a Greek Uncle Gus. 🙂 Chris shares his top lessons he learned from his uncle that allowed him to create several very successful businesses. One piece of advice that Uncle Gus said to Chris that changed his life forever! Top 3 lessons every person can use in their own lives to become successful with anything they strive for in their life! These are truly life lessons, not just business lessons that will last you a lifetime! So, head over to the Itunes or Stitcher right now and listen to the podcast. Once you are listen to the episode, remember to review and rate it on Itunes and come back to mastersunite.com to download a free copy of the “Simple Shift” Business Manifesto. Make sure you check out Chris’ 2017 podfest.us Multimedia Expo in Orlando, Florida on February 23-25, 2016.